My name’s Daniel Albuschat, I’m fascinated by computer technology and especially programming languages. I have my own unconventional ideas about how computing *should* look like and try to gradually build tools to realize this vision. Because of my daytime job and many hobbys apart from programming, I often only have time during my work-hours to work on those, hence it is constrained by what is vital and beneficial to the company I’m working at. My hobbies include computer games (we’re all still kids inside, right? :-D), Anime (japanese animation series and movies), learning Japanese and spending much time with my friends. Where do you live/What you do? I’m living in a small village near Cologne, Germany. I’m working at Treesoft (see http://www.treesoft.de), a small business with currently 24 employees. Treesoft develops, sells and supports CAD, CRM and ERP applications programmed in Delphi, C++ and Qt. Of course, the database of all three products is Firebird! programming languages and technology using books and the internet, I decided to put my priority on earning money instead of education. How do you use Firebird and how much? 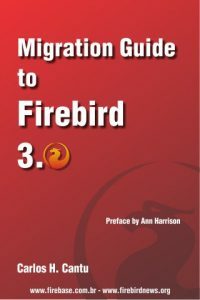 Firebird was the first database I got in touch with and I am still convinced that it is the best choice for most purposes. When I started at Treesoft we were developing the ERP solution which was based on Firebird. Treesoft CRM, which I have initially been the main and only author for, evolved from that application and of course used Firebird as it’s database, too. I have roughly written 20.000 lines of SQL scripts during that time, not including the embedded SQL in the application. Virtually no day passes that I am not maintaining or programming for Firebird. What do you like about Firebird/What you don’t and want to be improved? (Real) Unicode support came faaar too late. When I had been in charge of selecting the database when Treesoft started developing the ERP software, my choice would’ve been against Firebird because it did not have Unicode support at that time. We’re still on a iso8859-1 database and it will take weeks to switch it to Unicode. While Events are a fine thing, the possibilities are too limited. Events should take parameters! Otherwise it’s nearly impossible to create an automatically updating view of a table in your application or propagate more complex events. SERVICE switch). The services API has a bug that prevents it to work on database with spaces in the path, so we are forced to use the slower gbak call. Maybe this is fixed in Firebird 2.x already, we’re unfortunately still stuck on 1.5. Many API wrappers and database access libraries need to parse and/or understand SQL statements to offer some enhanced features. In my opinion, the parser that Firebird uses internally should be exposed in the client API to keep those wrappers and libraries future-proof (e.g. they still work when the SQL syntax changes in a future version). This would easily enable good and reliable auto-completion in SQL-editors, too. As for Firebird 1.5, the client library was not thread safe. This is extremely inconvenient, especially in GUI applications. The client/server-model enables your application to do complex operations without utilizing the local computer’s resources. When the resources are free, why on earth should the application stand still and *wait* for the server to finish? IMHO this is contrary to the very principals of client/server architectures. And because the Firebird API is not asynchronous, the only way to accomplish this is using threads. That the API even prevents this “workaround” is quite sad. What do you like about Qt and what you don’t? it becomes the de-facto standard for GUI in C++ and maybe even Java and Python. interfaces and applications using it that I don’t want to miss it anymore. Even our trainees had a very easy time getting familiar with it, although one of them didn’t even know C++ at the time he started working at Treesoft. The single bad thing about Qt is MOC and the hacked, string-based signal/slot mechanism. That’s really awful, especially since it’s such a central and frequently used feature. In Qt, you connect signals to slots via the method’s name. Qt adds real runtime meta object information and uses this to find slots that are connected to signals. Furthermore, it uses dynamic dispatching of arguments to call those slots. The dynamic dispatching is not the most efficient way to do things, but it’s still fast enough for mostly everything I’ve done so far. What’s bad about Qt’s signal/slots is that it is not compile-time safe. The compiler does not spot incorrectly connected signals, which is very inconvenient and can become a real problem. Great features such as easy integration of WebKit, platform independent GUI that respects custom styles on UNIX platforms, extremely fast graphics (maybe the fastest common-use graphics and GUI toolkit you’ll ever find), built-in database-access to every important database (including Interbase and Firebird, of course!) and many classes and tools that help you code platform-independently make more than up for this single “mistake”. I must admit hat I never used the raw API myself. I had to debug libraries using it, though, and am therefore a bit familiar with it. I use IBPP (http://www.ibpp.org) for everything I need to do with Firebird. And because the Firebird API is so awkward to program, I’ve created a cleaner, more straight forward C-API that should be used when creating bindings to Firebird for other programming languages. beginners or not. I’m quite frequently in touch with people trying to learn programming and am always asked for good tutorials or books to get started. Until now I recommended “Accelerated C++” by Andrew Koenig and Barbara E. Moo. Maybe my new recommendation will be Bjarne’s “Programming: Principles and Practice Using C++”. programming always involves using some complex libraries. Because the reader obviously will not be able to understand and use such libraries, we’ve written our own that will be trimmed down to the bare minimum. Namely, there will be an object “playground::screen” that consists of two methods: The constructor taking a width and a height and a function put_pixel(x, y, r, g, b) to draw a pixel. development environment for the reader, so he does not have the headache to install and set up a compiler. The tutorial is planned on http://cpptut.wikia.com and on IRC in #c++.de on quakenet. There’s one article on the internet that I regard a must-read, too. It’s from Joel on Software and about Unicode and character sets: http://www.joelonsoftware.com/articles/Unicode.html. I experienced that many users and even programmer don’t remotely get what character sets are and what Unicode and UTF-8 really means. execute a select-statement and wait for the server to prepare and execute it. Instead, you should send an “execute”-request and wait for a reply that includes the fetched data. This much more in accordance to the client/server model, as I already described above. TsSqlDatabase provides such a request/reply-like API for Firebird, effectively making it possible to write non-blocking database applications. Being non-blocking enables you to create most vivid user experiences and will make your program feel much smoother and more professional. Another part of TsSqlDatabase is a data-model that can be used together with QListView, QTableView and QTreeView (and any other view that is compatible to Qt’s model/view-architecture). The model asynchronously fills itself with data and implements a few optimizations that make it extremely fast and responsive and reduces network-traffic and server-load to a minimum. Additionally it is possible to mix data that comes directly from the database with data that may be calculated on-the-fly. This is true not only for columns, as it is possible in most database libraries, but also for rows. All in all, I believe that TsSqlDatabase lets you use databases as they are supposed to be used, as opposed to the “old-fashioned” execute-fetch-loop that is in use in most applications. There is one limitation, though. TsSqlDatabase makes heavy use of Qt and therefore depends on Qt. In a later state I will maybe build it as a DLL that exposes only a C and/or C++ interface without the need of Qt. I always hate dependencies, but in this case Qt was of so much help that I did not want to write it in plain C++. I wanted to do a video-demo when publishing it anyways, so I’d appreciate that. But it may very well be still a few weeks until this will happen. What browser do you use what os do you like use? I have been using Linux for 2 or 3 years on my desktop at home, but then I wanted to be able to play games on my PC again and switched back to Windows XP. I was using one instance of Gentoo Linux before that survived a multitude of hardware and harddisk changes, until my portage database broke and I was not able to update and install anything anymore. When Vista came out, I bought a license, installed it on my desktop and used it for a few months. But Vista is just such a pain! It was virtuallly incompatible to everything in the beginning, and Vista 64bit still is even nowadays. So back to XP again… until recently. I’m currently using Windows 7 Beta on my desktop and must admit that I am very surprised by it’s speed and stability. On my home-server I’m using Debian GNU/Linux and am very satisfied with it. Ubuntu is very cool and user-friendly, too. I played with it on my desktop and it’s really miles away from what I was used to when I still used Gentoo in regards to easiness and user interface. List of interesting projects/products do you use from the Firebird community? Habitual I am using IBOConsole for my regular Firebird SQL tasks. We’ve bought a company license of Firebird Maestro, which looks pretty cool, but it’s missing important keyboard shortcuts for me. I don’t want to use the mouse for anything when doing database-work. Other than that, there are very few Firebird tools I am using. Most frequently used are IBOConsole, isql and gbak. I’m still looking for a good replication tool that I can use to copy selected data from one database to another, including complex, partially recursive dependencies. What I have seen so far is stone old and only half functional. Maybe someone has a recommendation for me? Yes embedded systems are quite tempting to me and I loved coding microcontrollers in assembler in school. The thing is just this: I don’t have any idea what cool things I could do with one. If I had one, I’d immediately order a Beagle Board. Hehe yeah, GPGPUs (General Purpose Graphics Processing Units) are cool and it’s good to see how they’re put into use by many video decoders, SETI and Folding@Home, etc. I was glad when I learned that what I proposed was actually already available in Firebird 2.0. Except from better events and a different approach to the Firebird API (including access to the engine’s SQL parser), there’s currently nothing on my mind that I’d need improved. I’m subscribed to Firebird-Architect, but rarely read the messages because of time constraints. Future plans? what do you think of Firebird Roadmap what would you like to be added or pressing issues that needs to be solved? There’s one big issue with Firebird that is not even technical. the Firebird Foundation is a non-profit organization that does have income, but it’s very limited. And I’m always experiencing that Firebird is not as widely known as the free competition such as MySQL and PostgreSQL. A few years ago, Firebird had the chance to gain massive momentum because it was incredibly superior to MySQL. Back in the days when MySQL didn’t even support foreign keys, triggers or stored procedures. Now that those features have been added and the performance is not as bad as it used to be, Firebird’s chance to easily gain popularity simply through better quality is over, unfortunately. What needs to be done now is classical marketing to advertise Firebird and make it more popular and more widely known. It still has advantages over MySQL, for example standalone-file-databases, easy deployment, performance, etc. When the Firebird Foundation earns more money it can possibly recruit more developers or pay already active developers to work full time, which will increase the pace of Firebird’s evolution. Not directly a dedication, but I would like to advertise the inofficial Firebird support chat on Freenode. Freenode is a free IRC server that provides chat-facilities for free and open-source projects, see http://www.freenode.net. You can join our discussion in #firebird on irc.freenode.net. Thanks for giving me the chance to publish my views and opinions on various topics. I hope Firebird continues to evolve and gains popularity to finally be the #1 Free RDBMS. Daniel, the fact that gbak takes longer than “service api backup” is mostly due to network bottleneck. “Service backup” actually uses internal gbak to do its job, but of course it is much faster when data doesn’t need to travel cables (or air). About languages, I’m not sure if “external languages” would help too much to do “SQL work” inside procedures and triggers. I’m happy with PSQL. About exposing Firebird parser, I think it can be a good idea, but I’m not sure if API is the right way to implement it. Maybe creating virtual tables that would return the “parsed” elements of the SQL statement would be better. The thing is that gbak without service manager is even slower on local connections, which should not be the case. Firebird is not slower when using localhost:/path/to/db, either. Exposing the SQL parser via SQL is a nice idea, the only shortcoming is that a parser works on hierarchical tree-like data and SQL is simply not suited for this. Think about embedded sub-selects, etc.